We are proud to announce that the Pacific Club Condominium Association has selected Tinnelly Law Group as its corporate counsel. Located in the beatiful beach-side community of Playa del Rey, California, the prestigious Pacific Club development consists of 180 luxury condominiums located just three blocks from the ocean. Pacific Club is a community of friendly residents who enjoy resort style living with fantastic amenities and short walks to the beach, restaurants and retail stores. 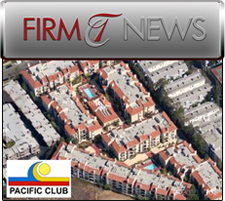 We look forward to working with Pacific Club and to developing another lasting relationship with a condominium association client.